Israel - Thousands of ultra-Orthodox Jews blocked highways across Israel on Thursday and clashed with security forces to protest government plans to draft them into the military, police said. The simultaneous rallies in numerous locations caused large traffic jams, said police spokesman Micky Rosenfeld. In Jerusalem, some 400 activists tried to block the entrance to the city but were dispersed with water cannons and 15 were arrested. In the southern city of Ashdod, the demonstrators hurled stones at the police, injuring two policemen. Rosenfeld said eight protesters were arrested there. Elsewhere, a major highway in central Israel was blocked by about 2,000 protesters. Police on horses beat back demonstrators with clubs and used to stun grenades to clear the roads. The riots follow a Supreme Court ruling this week ordering funding halted to ultra-Orthodox seminaries whose students dodge the draft. Finance Minister Yair Lapid’s freezing of the funds sparked angry warnings from ultra-Orthodox leaders. 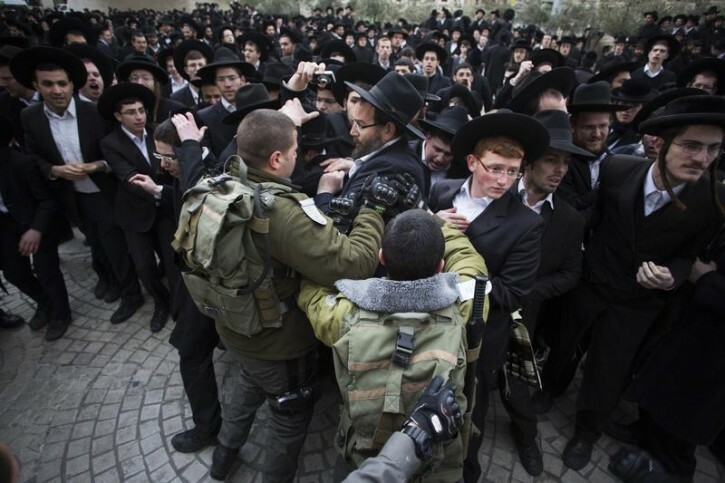 Ultra-Orthodox Jews have for years been exempt from military service, which is compulsory for Jewish Israelis. The arrangement has caused widespread resentment among Israel’s secular majority and featured prominently in last year’s election. A new system that would gradually reduce the number of exemptions and require all to register for service awaits parliamentary approval. 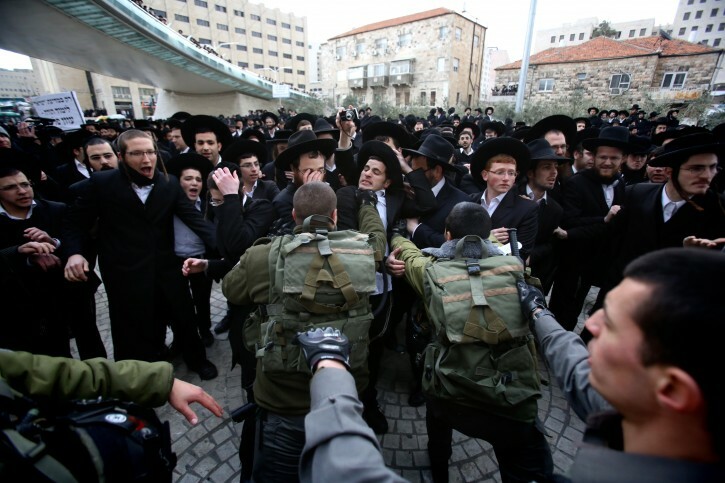 The ultra-Orthodox have been demonstrating against the plan and condemned the court decision. They claim the military will expose their youth to secularism and undermine their devout lifestyle. The issue of army service is at the core of a cultural war over the place of ultra-Orthodox Jews in Israeli society. The ultra-Orthodox, who make up about 8 percent of Israel’s 8 million citizens, have largely been allowed to skip compulsory military service to pursue their religious studies. Older men often avoid the workforce and collect welfare stipends while continuing to study full time. There will be civil war. The Jewish people will no longer serve the Haredim. Is that AlterG I see in the photos taunting the Israeli policemen ? Ridiculous... Do they really think act like this will help their cause, if anything, this gives reason why these kids should be drafted in the first place. *wondering* were these authorized by any of the rabbis..? Go to work and stop kvetching. Mr Alterg please tell me why the charedim never embraced vadas tal. It was for older married men not young 18 year old bochrim and they would do some silly national service for three months. Don't yell chazor treif. Because people that age have no problem sitting in a mixed secular enviornment in the knesset. So where were the charedim then? The answer is the army draft is a blony excuse. They just don't want to work. The proof is in the pudding. “ Ridiculous... Do they really think act like this will help their cause, if anything, this gives reason why these kids should be drafted in the first place. cocum einer, it helped stop the war in vietnam, and it will break the zionims cutzpah to, Don't be a coward. How do the Haredim serve the Jewish people? You're useless. Nobody needs you for anything. The Torah exists independently of you. We don't need you to pray to Hashem and we don't need to prove our faith to you. You are not the priesthood, and now Hashem will show you the error of your ways. of course its shver when you don't begin to work just participating in every idiotic demonstration and roam the street with shopping bags! If you're already invoking the nazis, I would sooner compare the vicious policemen to them. And if you think a few Uzis would've helped against the SS, then you're a silly fool. Assuming your reffering to zali versus ahroni. Civil war coming up unless the gedolim come up with a solution which satisfies both parties. All of you (Numbers 1, 5 and 9) miss the point! These people refuse to violate their beliefs! They feel (and its corroborated with mountains of evidence) that serving in the IDF will cause them to sin (very loose morals etc) and dont believe in the zionist ideology. Simply put these very same people here in the USA would be exempt from serving as conscientious objectors. If the IDF really wanted these 'chevra' to serve why not change the attitude of the IDF? How come they force women to sing at events in the name of equality and promote an environment where men and women mix in training (sometimes even promoted) and end up committing sins that are accepted as normal. Even the US army has designated their education team to train the women in separate systems albeit in the field . The answer is that the LEFT and hence the IDF, doesnst care about drafting chareidim so that they serve their country, they have an agenda and that is to break their religiosity. In other words their (chareidim) commitment to god is at stake. Lets look at the stats form the past two thousand years in a battle for religion beliefs we Jews have always won. It just may take a while. Well. we see they know how to fight. Just focus that aggressiveness on Arabs, not fellow Jews. No. Alterg is the part of the horse directly below the tail. time for you to go over there and start protesting! 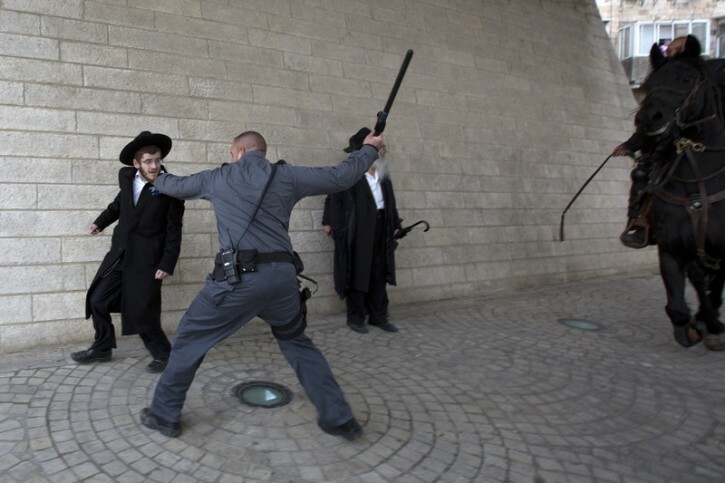 It's sickening to see one Jew hitting another! As much as I sympathize with you and my own grandparents , your kefira smells to the heaven above. Too bad that horse that did not use her back hoofs to kick the moron that was pulling her tail! He deeply deserved that. 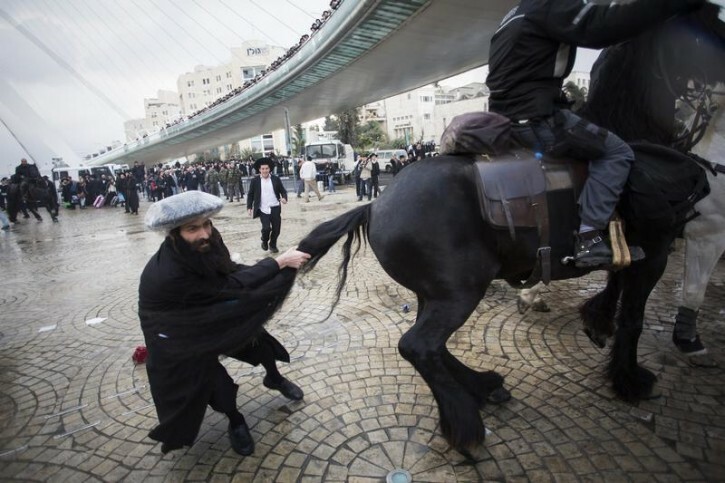 The horse has a more Yiddishe neshama than SOME of these Chasidim. “ If you're already invoking the nazis, I would sooner compare the vicious policemen to them. “ All of you (Numbers 1, 5 and 9) miss the point! These people refuse to violate their beliefs! They feel (and its corroborated with mountains of evidence) that serving in the IDF will cause them to sin (very loose morals etc) and dont believe in the zionist ideology. In general the IDF is not as hostile to caherdim as you make it. Please stop picking on isolated stories of one rooten apple as a proof of the greater picture. There is absoulty no "mountain of evidence" to prove that its a war on charedim. Speak to charedim that did serve most of them had a pleasurable experience. And as far as I know Nachal Charedi is separate. No training with mixed men and women. Stop making up nonsense. Reb Dov keep up your good work! Vietnam had the backing of the masses i.e. the majority of America, whereas, here it's the other way around. I can only see how this will play right into the hands of that clown Lapid. Yea...the Israel police, you mean!!!!!!!!!!! !Vicious barbaric jews who think the state could survive without a kol torah.......just wait and see what will happen to your "beautiful medina" if Torah is going to be tampered with...just wait and see.Of course, you'll never agree...everything will just be a "coincidence".! Disgustging pathetic and sad you are...and the trouble is, you don't even know it! You think the uzi is protecting you? Then you are more pathetic than I care to think. But already know. No sense in talking to someone without seichel. These pictures made me sick to my stomach. The looks of hatred from both sides. Oy. Really, you are the erev rav...and you will be left behind..what a joke you are! No one asks you to give tzedaka..you can give to whomever you choose. Hashem has enough money to give those in need. He serves the poor through the kind and giving. You obviously don't fall into those catagories. Megalgalin zechus al yedei zachei...you are faaaaar removed from that. Right or wrong doesnt matter, what matters is that you cannot force a culture by force onto another people in 2013.
its sad charaidim act in such a primitive childish manner. is this the product of torah is this the way supposedly people would keep hashem holy torah act like low lifes? They need to continue to do this every day with more folks, so the kufrim will feel it in their Torah'less brains. I'm with you brothers. Stay strong. Ok, dont serve them, but you wont force them to serve in army, it just wont happen, not with force. This is an organized sector of society, and you dont win such people, ever. Besides, the political and financial damage that Hareidim in diaspora will and have already began to employ to the Israeli government, are way more costly. You do not win with force, not in today's day. Look Israel has plenty on their hand with the Palestinian's, they dont need these two groups teaming up internationally. They are not fighting the Satamer , they are fighting their friends that participate in elections and usually dont protest at all. All this has done (right or wrong) it aligned the Hareidi left with Satmar and the damage internationally, as well as local, will soon begin to bear fruit. The Zionist government is entrenched in a silly and stubborn war, totally purposeless and they know it. They are feeding this, instead of letting fall to the side lines. They are not Chassidim, it's Yerushaliem perushim (litvaks). “ Vietnam had the backing of the masses i.e. the majority of America, whereas, here it's the other way around. On the contrary, the tactic the Israeli Government has taken is so so so silly, they really going to take an entire population into the army by "force"??? Do they even need them? I am not arguing whether they should or shouldn't serve, the point is, the tactic they have chosen, I.e. issuing arrests on innocent young boys who are usually told what to do till they are married, cutting off funds, harassing their life style etc. will only increase the already spread hate amongst religious Jews. I can only see how this will play right into the hands of Satmar and NK. Uch in viy to you. Gedengst vooss izz geshayn in Chevron 1929? In America, when someone supports a yeshiva, they make them a dinner and give them kavod, here, the government has supported yeshivas all these years and now they riot. Shame Zech. “ In general the IDF is not as hostile to caherdim as you make it. Please stop picking on isolated stories of one rooten apple as a proof of the greater picture. There is absoulty no "mountain of evidence" to prove that its a war on charedim. Speak to charedim that did serve most of them had a pleasurable experience. And as far as I know Nachal Charedi is separate. No training with mixed men and women. Stop making up nonsense. I guess I have a bridge in NY to sell you. Its named the Brooklyn Bridge (you can make so much money on charging tolls so I'll give you a break and sell it to you for $100). If you even start to 'open your eyes' you will 'see' the mountain of evidence. lets not start and argue that these are isolated cases. Its a planned set of tactics that has been placed in 'play'. Stop drinking the cool aid! So big deal that some frum people had a decent experience. How many have had 'bad' experiences? -- Many who have put up with the crap so that they get their service done and move on. If they want to stop funding the yeshivos in lieu of serving that's their decision, but to criminalize the act of not serving is wrong. “ its sad charaidim act in such a primitive childish manner. is this the product of torah is this the way supposedly people would keep hashem holy torah act like low lifes? Primitive!!?? That they dont want to move from a public park, yes the area under the bridge is pedestrian only. Cant you see the walkways? Why shouldn't they protest their ideas? Its what the Zionist/Medina wants, no? Didnt the Zionist do the same thing to the British. Oh, in those days they used bombs, real ones (Begun). If the country (Medina) respected everyone's beliefs they would create an allowance for objectors and this would be a mute point, but I guess you knew that. You just can't stand to see a pure Jewish person protest what they see as wrong. Could I suggest that you may be closer to an anti-Semite than you think. Just because you are Jewish doesn't mean you're dont' hate other Jews. They were not rioting for lack of Yeshivah funds. They protested for the 'forced' requirement to serve in a situation that they feel is against their religion. Whether they are wrong they are entitled to protest. Under any democracy you have the right protest a government decision. Or are you saying that Israel is not democratic. Well if that's the case why should the USA support them? Let the Arabs rule, they (the arabs) sure are not democratic. Since the Israel Government takes funds from the US they should emulate them and allow for conscientious objectors. The facts are that they gave them kovod there too, you know it. They are rioting cause they dont want to go into the army, just stick to the facts. Not taking sides on the merits, just want to get this straight. Who needs your services...go give to whomever you want. did you not understand what I wrote. You think the world is dependant on you? Who are you? We all make choices who we want to give to. What are you trying to show here. ...that you are such a good person, but you won't give to them, don't ....who's asking you to. In the end, everyone gets what they need in this life, from you, from someone else...from whomever. It's all from Hashem, not from you. Who a person chooses to support comes from above, even though you made the choice. Hashem gives us the thoughts, we are puppets.He gives everyone what they need, end of story.Nobody is going to miss YOUR NOT GIVING...YOU DON'T HOLD A MONOPOLY ON GIVING..
“ The facts are that they gave them kovod there too, you know it. They are rioting cause they dont want to go into the army, just stick to the facts. While I commend you for defending the protest, I must point out that they did not riot. A riot is where people 'trash' the area of protest. They protested civilly and the Police sent in their 'goons' with clubs and horses. Since when is 'Stand your ground' rioting???? Was there a single smashed window to citizen's car!? Was there rocks thrown at buses!? What part of the riot did I miss??? These were citizens protesting a government decision in the most non-violent way until the Mishtara came! Reading all these horrific comments are maybe just as bad as these horrific pictures! Nonsense. Your fellow human beings support you. What do think is free in this world. Not even water is free. Money talks. Let them provide for themselves. Show us how self reliant you are. Peace. You must agree that what the poster is saying 'that he will not give' will cause more hardship on anyone from that group to collect in the future. While it's true that everyone gets what hashem gives, it could be harder to get that mezonos. It is just great to see all of the wonderful things that these men are learning in yeshiva and kollel. 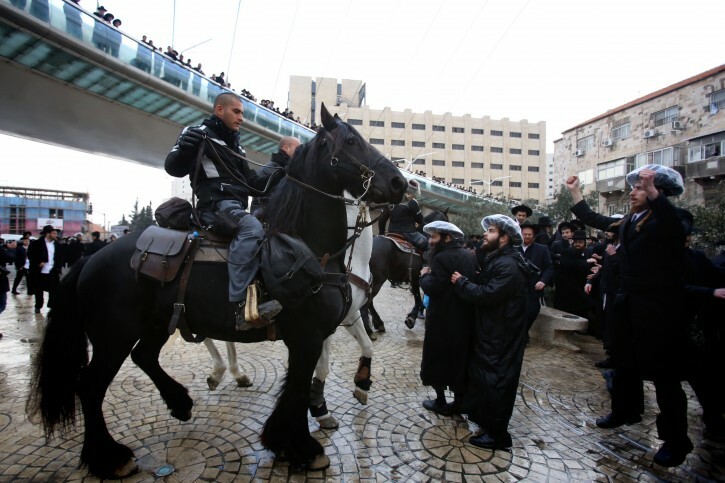 Pulling the tail of a horse, burning police cars, rioting, throwing rocks at police - all, no doubt, excellent Torah values. I just can't understand why a secular Israeli wouldn't be willing to spend years risking his life and paying high taxes to support such excellent scholars. Baloney. Facts are that for years they had an option called vadas Tal. Under vadas Tal, those married and 28 years old were able do some national service for three months (IE peel potatoes for the army, hospital) and then they were free to work. I wouldn't call that " having to serve in the army". But nobody embraced that plan. And they bashmutzed R Aron Lieb for such a plan. Do you know why? Becuase this army thing is an excuse. They are really mad that they won't get the pork. Those are the real facts and proven already. By the way this is not to say that draft dodgers should be criminalized. I think thats a bit much. But facts are these guys are upset because they just don't want to work. Allow them to work and they will. There brothers in diaspora all work and are pretty successful. They are being harassed by the media and discriminated in the work place, they stand no chance, besides it goes against everything they believe in to mingle in a army of heresy & social engineering. “ Disgustging pathetic and sad you are...and the trouble is, you don't even know it! “ Ok, dont serve them, but you wont force them to serve in army, it just wont happen, not with force. This is an organized sector of society, and you dont win such people, ever. ok let them sign a contract that we are on our own hashem protects us we do not need the idf and do not want the idf to protect us in any circumstances, Torah protects us. “ They were not rioting for lack of Yeshivah funds. They protested for the 'forced' requirement to serve in a situation that they feel is against their religion. Whether they are wrong they are entitled to protest. Under any democracy you have the right protest a government decision. Or are you saying that Israel is not democratic. Well if that's the case why should the USA support them? Let the Arabs rule, they (the arabs) sure are not democratic. even in the USA conscientious objectors. do something maybe work in the kuchen or something else. The cherediem have even refused that. “ You must agree that what the poster is saying 'that he will not give' will cause more hardship on anyone from that group to collect in the future. While it's true that everyone gets what hashem gives, it could be harder to get that mezonos. Disagreed. No tangible hardship will be caused. Men with non-Jewish mindset like Anon #48 never gave to any seriously Jewish causes and mosdos to begin with. So nothing will change. 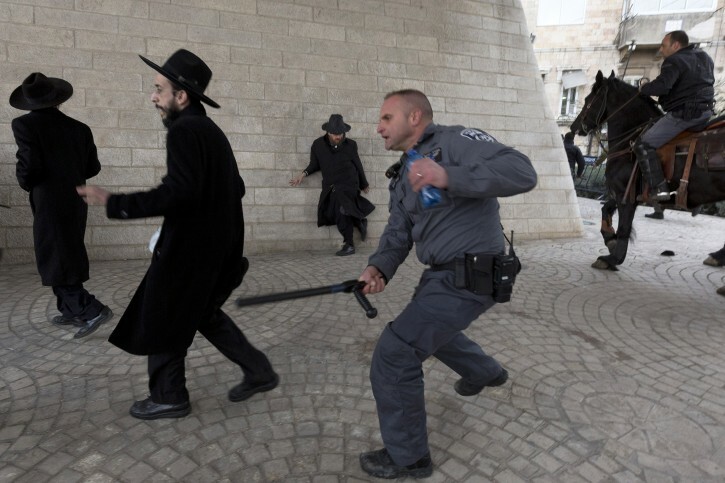 look at the hatred in these Israeli policeman faces ,hashem yerachem ,no goy in the uk would give u such open hatred as these so called jewish policeman ,whats the world coming to. “ Baloney. Facts are that for years they had an option called vadas Tal. Under vadas Tal, those married and 28 years old were able do some national service for three months (IE peel potatoes for the army, hospital) and then they were free to work. I wouldn't call that " having to serve in the army". But nobody embraced that plan. And they bashmutzed R Aron Lieb for such a plan. Do you know why? Becuase this army thing is an excuse. They are really mad that they won't get the pork. Not true, simply not true. Not rioting, it's called assembling in the public square and demonstrating (not rioting) the arrests of young boys that fail to show up. “ On the contrary, the tactic the Israeli Government has taken is so so so silly, they really going to take an entire population into the army by "force"??? Do they even need them? "I can only see how this will play right into the hands of Satmar and NK." You got your fact distorted, do you really think Satmar and the NK play any role in Isreal? Force can indeed be applied by cutting off fundings...who writes the checks? Who funds the taxes? You have the choice; either you adopt the NK policy and not recognize the gov in any way, or work out a solution. The typical secular Israeli does not comprehend the concept that you serve via Torah learning, while they can't force you to serve but you sure can't force them have to fund it..
From a Torah perspective, the ones losing out the most is the state of Isreal, for over 50 yrs Israel has been the biggest supporter of Torah ever, and has no doubt been a factor in its success. “ ok let them sign a contract that we are on our own hashem protects us we do not need the idf and do not want the idf to protect us in any circumstances, Torah protects us. We already signed that contract at Har Sinai. The protests were called by the Edah Haredis, which is mostly Hasidic, along with Litvaks who follow R. Shmuel Auerbach. Most of the Litvishe world, a large majority, follows Rav Aharon Leib Steinman shlit"a, who is against such things. And many Hasidim are not part of the Edah Haredis, and don't participate either. So it is not the majority of frum involved. “ "I can only see how this will play right into the hands of Satmar and NK." Does torah learning pay bills? Get real. Not true at all. Not a single German Einsatzgrup member was killed while slaughtering your bubbies amd Zaidees. Even a few machine guns in the hands of the defenseless Jews would have meant at least some Germans would have been sent back home in boxes. Mark my words right here and now. Every intafada is preceded by the Arabs observing stupid actions by ultra religious fanatics. Nebech thanks to these morons the Arabs will now be attacking ALL the Yidden again shortly. It does...but not in the way to make your pea brain understand any of it. If you were a true religious jew, you would know that G...d controls everything, even what YOU PUT INTO YOUR MOUTH. So get off your high horse and your "Koichi V'oitzrim Yudi" attitude...cuz the sweat of your brow is not what earns you anything. G...ds will is. Not that you would understand any of that! The Edah is compromised of Perushim and Chassidm, it's really mostly Briskers that founded the Edah. “ Allow them to work and they will. There brothers in diaspora all work and are pretty successful. really then why is KJ and kver have one of the highest rates of poverty in the USA? Either they are not doing well, or fraud which one is it? Satmer and NK are a huge headache as they fund extreme elements in Israel and organize demonstrations at the UN. They also are very politically active in tarnishing Israel's name all over the world. This is a fact that should not be dismissed, Israel dismissed the Palestinian's too. We are already seeing pretty a strong alliance between Satmer and some fractions of the Agudah leadership, including protests at the USA. I've seen some very interesting Op-eds in the Yeted and Hamodia, with a similar ideology to Satmer Ruv and even quoting him. Israel does not want to lose the Orthodox support altogether, they really dont. They thrive off the fringes of Orthodoxy.They definitely dont want this to become a political "war". In regards to the "force", they are trying to do it by "physical" force and arrests, that's what has ignited this storm. While it's a zchus to support Torah, Chareidim will not abandon Torah for money, they will find a way around. They are beginning to get financial aid from their brethren in the USA who are affluent businessmen and dont mind supporting Torah. Satmer will show them how to do it, they have been doing it for 50 years. #71 so according to you no one should be learning and everyone needs to work to pay bills? Are you Jewish ? For all of those who claim that they were demonstrating and NOT rioting: THEY CLOSED MAJOR ENTRANCES TO JERUSALEM!!! I was once sitting in the traffic jam that such a demonstration caused for TWO HOURS!!!! As a result, I missed a class and I was so late home that I had to have a neighbor pick my baby up from day care and give him supper. They were disrupting the peace. The police were doing their job to make sure citizens could get home, to doctor appointments, to business, to their children. Strange. I'd have thought that chareidim would appreciate funds being cut. After all, if they hate the medinah that much and want nothing to do wit it, then they shouldn't want it's tumah money either. So, I guess the State is ok when it comes to taking, but evil when it demands participation. Nice to know where chareidi priorities lie. Either way, the question to the Zionists is, be smart not right. Why are the feeding theses chareidim? Ignore them the same way they ignore Israeli Arabs and Beduin's . “ Satmer and NK are a huge headache as they fund extreme elements in Israel and organize demonstrations at the UN. They also are very politically active in tarnishing Israel's name all over the world. This is a fact that should not be dismissed, Israel dismissed the Palestinian's too. Amazing how you live in your small world surrounded by Satmar. How many mosdos and families are there Satmar/ Toldot Ahron, etc. in Isreal? They are not even 5% of the Haredi population, and they they have been struggling and fundraising all these years all over the place..